2 way HDMI over CAT5 splitter, 2x CAT5/CAT6 RJ45 UTP output ports and 2 receivers. Splits an HDMI signal to 2 remote screens via CAT5 or CAT6 network cable. 2 HDMI over CAT5 receivers supplied. Supports 1080p up to 30m using CAT6 shielded network cable. Supports deep colour 8 bits per channel, 24 bits total. 5V 2A power supplies included in kit. Kit includes 1x Sender splitter, 2x receivers, power adapters and user manual. 1 network cable is required from the splitter to each receiver. Yes, the splitter and each receiver need their power supply connected. 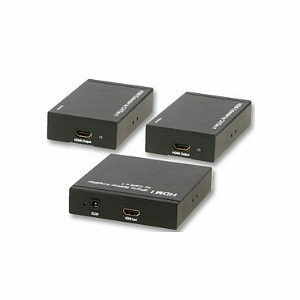 HDMI over Single CAT5 Extender, 1080p up to 50m Send HDMI 50 metres over a single ethernet cable. Suitable for all HD resolutions including 720p, 1080i and 1080p. Supports up to 50 meters at 1080p when using a single CAT6 network cable. Auto-adjustment of feedback, equalization. HDCP compliant. Not compatible with DVI equipment. Single Cat5 or Cat6 (recommended) cables required, not supplied. Easy to install, small size. Package includes sender unit, receiver unit and 2 x 5v power supplies.